This may be a first time for me to ever say this–and it might even be the first time this has ever been stated in the English language, but I’m excited about a new pair of gloves I just bought. 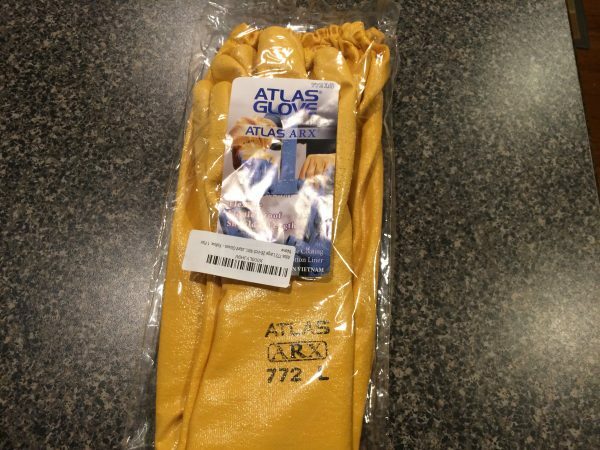 They are bright yellow gloves, made by a company called Atlas. The pair I bought was only $8, so I thought, “I’ll give it a shot.” (UPDATE–I’ve noticed the price is fluctuating a bit online right now in the $10 range). For eight bucks, I was expecting a piece of junk…and even after the package arrived…I was still thinking they might be junk. The packaging isn’t much. The gloves come in a clear plastic bag. There is a no frills Atlas label on the front. Perfectly adequate and unremkable at the same time. The gloves are 26 inches long. When I compared this to the Coralife brand gloves, they are 2 inches shorter. I wasn’t sure if I would miss the 2 inches or not. I was actually a bit concerned about that. I’m not a large guy, by any stretch, I’m 5’10, and I found out today that my armspan is almost exactly 26 inches. The gloves fit all the way up my arm to the armpit. So I didn’t need the extra 2 inches. The gloves are made from Nitrile. The Coralife brand gloves are PVC. I’m not sure if that makes a meaningful difference or not. Inside, the gloves are lined with a soft, comfortable fabric material all the way up the sleeve. Inside, they feel nicer than I would expect an ugly yellow glove to feel. 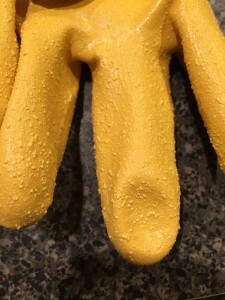 There is a texture on the finger-area of the gloves to aid with getting a grip on slippery wet things. I couldn’t tell one way or the other if this made a difference when I dunked my hands in the tank and started moving stuff around. Over the years, I have owned a few pairs of the Coralife brand gloves. Sticking my hands in the saltwater in my tank really tears them up. But after a while, those gloves become pretty nasty. Between sweat and water getting in over the top, the gloves quickly become smelly and gross, and I end up going back to dunking my bare hands in the tank for a while. At $30 a pop, I find myself more willing to plunk down that dough on a coral or fish instead of aquarium gloves. Right before I foudn these gloves, I was ‘in between gloves’ and cut my hand (impaled actually) on a tube worm sticking out from a piece of live rock I was trying to move around. I will update this post in a few weeks and let you know if the Atlas gloves still get as stinky as the Coralife gloves, but at $8 a pair, instead of $30 a pair, it doesn’t hurt as much to throw them out and replace them. If you don’t use gloves currently, or if your pair of Coralife gloves are as stinky as mine were, you might want to check out this high quality, inexpensive nitrile gloves made by Atlas. I bought mine on Amazon. 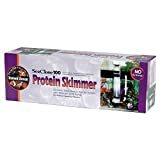 If you want, you can check them out through my affiliate link below to Amazon. If you purchase the gloves through that link, I’ll earn a small commission at no additional cost to you. No pressure though if you want to find them the good old fashioned way too. I know aquarium gloves are the most interesting piece of equipment, but protecting your hands is important and saving about $20 on gloves gets you 2 more frags. 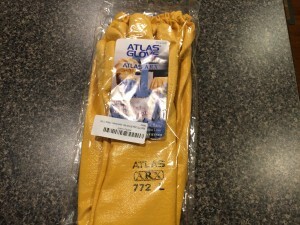 Before you reorder the reef aquarium gloves from Coralife, you may want to give these yellow gloves from Atlas a try. So far, I’m pretty happy with them. Six months after the original post, and I am here to report that the Atlas shoulder-length nitrile aquarium gloves are still great. I got them wet a couple of times (just a little bit) on the inside, but they dried out fine and work the same as they always have. No strange odors. These reef aquarium gloves from Atlas seem to be quite durable and a good value for the money. I have noticed that the price seems to fluctuate quite a bit online, so you may want to shop around a bit to ensure you get the best value. Interesting post. I had not thought of this option prior to your post. 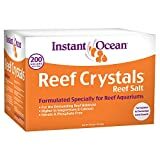 When I clean my tank I am always worried about brushing up against corals and living rock. I suspect these gloves might provide a little buffer there, but maybe the results would be negligible. I also wonder if these gloves would provide any protection against venomous fish like Foxface, Lionfish and Stone fish. Thanks for the note. There are tube worms and things growing on the live rock–these gloves will help prevent scratching or puncturing your skin against those. As far as protection from the venomous spines of certain fish–I would consider these gloves to be a barrier and a layer of protection, but not full protection. Lionfish spines puncture and a venom gland pumps in the venom—and while these gloves are thick and sturdy, they aren’t puncture proof–so as a result I would think there would still be some risk of puncture. What I think they would be good for is protection against inadvertent light contact. I suspect there is always residual risk when keeping these venomous fishes in our tanks. Hey there Al! While I am one for always telling folks that gloves are important so that one, not to affect the eco system within the tank but also as a safety measure. I will be the first one to admit I tend to use my hands alot and am in my tank almost daily… Many of those times I wear the gloves. I have the Red/Blue pair. I LOVE them. I have several mantis shrimp and softies in my tank that I have become sensitive to coral stings over the years. It is worth the buy but not for the extra 2 inches. I mean how deep can someone go without actually climbing on in the tank? lol What I would like to see is a smaller glove. My hands are not very big and when I put these gloves on while it does suction to my hand and allows me to maneuver around better it is not really good for reaching into the small places where a coral could stray and need to be removed. (I have a jawfish that likes to test my patience and a mantis shrimp that likes to surprise me). Thanks for the comment. 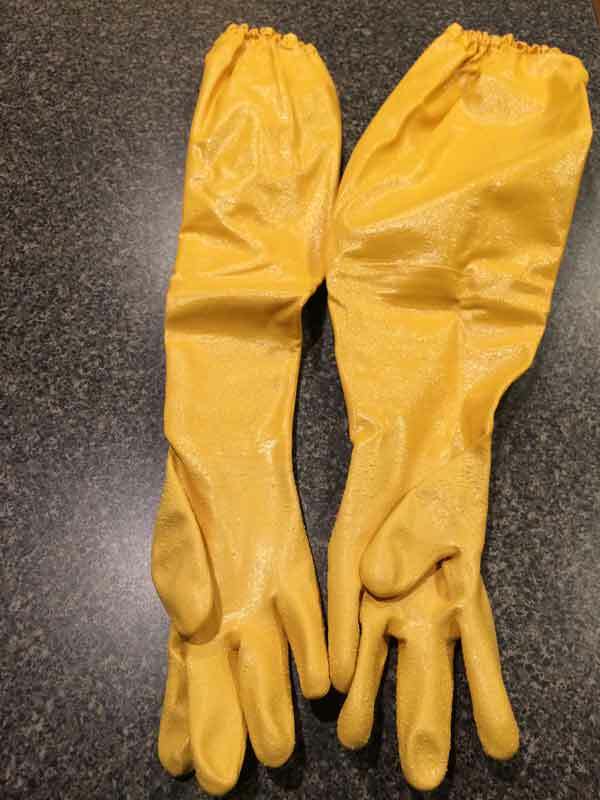 These yellow gloves are available in Medium, Large and Extra Large. You may find that the smaller size fits your hands better. My last pair of gloves were the red/blue Coralife brand too.They all get a bit stinky after a while, so I pitch them and get a new pair. That’s why I tried the yellow ones this time. They’re nicely made and a fraction of the price. I’d love to see a video of the mantis shrimp surprising you…that sounds fun. I actually use these Atlas glove daily, they hold up really well, I find that the nitrile material holds up much better than PVC or other plastics, they’re comfortable and don’t get nearly as funky. I’ve been happy with them, glad to see that you’re happy with them too! Mr. Fish, thanks for the comment. At this point, I’ve had the gloves for a while and there are still no signs of ‘funkiness’, as you put it. Those PVC gloves got smelly pretty fast. The material is still going strong. Thanks for weighing in here. I can’t find your amazon affiliate link. Hi Kelly, thanks for the comment and for thinking about using one of my affiliate links to check things out. I added a new link to the bottom of the post, to make it more clear. You could also use the ad on the page. Thanks for thinking about supporting the site and me this way. I do appreciate it. I have both pair of these gloves, I bought the atlas because the coralife gloves do not fit well. 8.00 was a great price! I just bought another pair of Atlas at the 12 and change price, great for the money. I own several pairs. I don’t mean to be negative about the coralife gloves, but I really do like the Atlas gloves so much better. I wouldn’t think that would be possible for ‘rubber gloves’ but they are a great deal. So how do they handle compared to the Coralife gloves? Are you able to better judge the amount of pressure you apply with your fingers using the Atlas gloves? When wearing the Coralife, I cannot gauge how much pressure I am using when I grab onto items in the tank. That makes it difficult to do delicate where I’d rather use my nitrile gloves that only go up to my wrist. Joe, thanks for the great question. These gloves have a similar thickness as the Coralife gloves–so you do not have the same kind of feeling as you would in the thin nitrile gloves you described. I use the Atlas gloves for most of the work–but to your point, if there is fine work that needs to be done, I will use disposable gloves…but I hate that feeling when they balloon up with water. The atlas gloves will keep you dry. Hope that helps.